School is back in session, or soon will be for most college students. While fall is the best time to focus on your academics and have a great start to the new semester, you can also focus on earning extra money in your spare time. If you’ve ever experienced the ‘broke college student’ lifestyle, you don’t have to allow it to be your reality during the remainder of your college years. 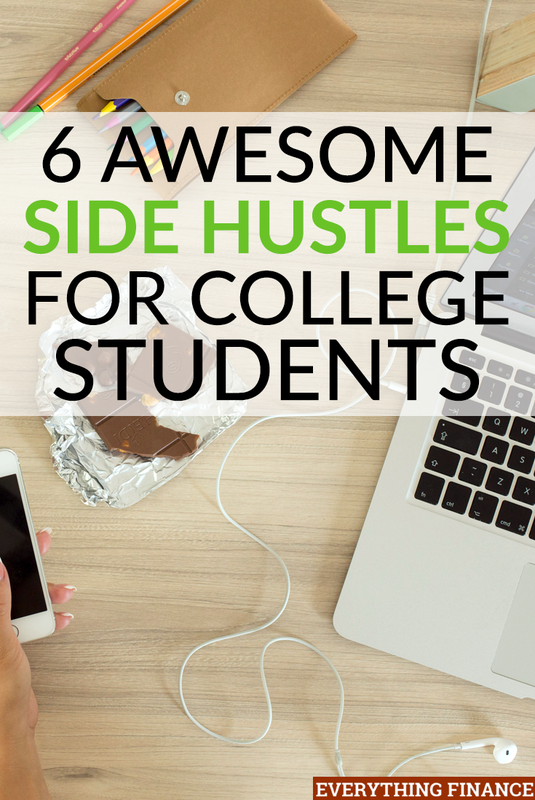 There are tons of lucrative and legitimate side hustle opportunities that are perfect for college students. Here are 6 side hustles to consider trying out while in college. If you are good at a specific subject, you could try your hand at tutoring other students on the side for money. Some colleges and universities actually pay students to tutor their peers. Peer-to-peer tutoring can be very effective and a great way to help other students out, whether you’re helping others solve complex math problems or edit papers. You can check with the Career Services department at your school to see if they have any opportunities. If your college doesn’t hire tutors, you can always look to your community for any leads. There are many tutoring agencies that hire college students to help younger school-aged kids with different subjects. This is a fun side hustle. If you live in a college town with a nightlife scene, odds are some bars may be looking for a DJ to play music a few nights a week. The equipment isn’t cheap, but you could easily make a couple hundred bucks per night if you are good. If you land a few recurring gigs, you could probably even live off that money in college and just focus on your classes when you’re not working. This is probably my favorite side hustle of all time, and I wish I would have pursued it more back in college. If you like to write articles, blog posts, and other literary pieces, create an online portfolio to showcase your work and see if you can actually get clients to pay you to write for their site. It takes some networking to get started, but you can get a mentor, connect with others on LinkedIn, or even take a writing course to kick off your freelance writing side hustle. Freelance writing is great because it’s super flexible and allows you to work around your class schedule and get assignments completed wherever there is an internet connection. If you know any friends or family members who have kids, ask if they need a babysitter from time to time so you can earn extra cash. If you’re comfortable with giving up a few hours during evenings and weekends (when most babysitters are required), you can make a decent amount of money. To expand your clientele, you can set up a profile on SitterCity.com or Care.com to advertise your services to other parents in the area. A lot of busy moms in college are often looking for babysitters to help out, so you could also create some flyers to put up around campus. Do you love to shop? As a mystery shopper, you can get paid to eat, try out different services, and buy products at your favorite retailers in your area. Companies pay mystery shoppers to go to stores and companies to observe certain aspects of the company and report their findings and observations after the experience. Mystery shoppers will never be bored with their assignments because there are so many different opportunities from stopping by a local ice cream shop or pizza restaurant to try out food and test the service, to getting an oil change or touring a local fitness center to critique their level of customer service. Mystery shoppers need to send in a detailed report after each assignment, and they often get paid per job and get reimbursed for any money they spend on food or products as part of their assignment. If you’d like to apply to be a mystery shopper, you can start by checking out websites like SecretShopper.com and BestMark.com. If you have old CDs, DVDs, electronic devices, coffee mugs, clothes, etc., you can sell them online for profit on sites like Amazon or Ebay. Instead of just selling the items you have and need to get rid of, you can create a continuous income stream by investing your earnings in other products you can sell. A great example of this is going to thrift stores and picking up quality items for cheap and selling them for a higher price online to make a profit. A lot of people do this with clothing and other goods, and some people even earn enough money from selling items on Amazon and Ebay that they do it full-time. You’ll always need to sell items for more than you purchase them for since both Amazon and Ebay take a cut out of your earnings if you use their platform to sell your items. Some of the most popular items to sell online include clothes and shoes, college textbooks, electronics, movies, video games, toys, and household supplies. As a busy college student, you have a lot to juggle. From keeping up with classes and studying for tests to paying regular bills, managing your life at home and working a part-time job, you may feel like you don’t have enough time to earn any extra money. This is why you need to try a side hustle that is flexible and profitable to fit your schedule and your needs. The great thing about all of these side hustles is that they either pay well already, or there isn’t a firm cap on how much you can earn. With a traditional job, you have an hourly rate or a salary and you can only work so many hours. With side hustling, you can scale up and raise your rates whenever you want, or you can cut back on work if you need to slow down to focus on your studies. Have you ever tried any of these side hustles before? Do any sound like they could work for your situation?